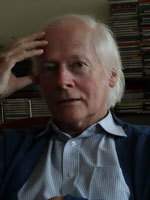 Gerald Glynn (b. 3 September 1943) was born in Brisbane and studied music, literature, languages (French and Japanese) and mathematics in Brisbane and Sydney. He gained his Bachelor of Arts degree with First Class Honours from the University of Queensland in 1965 with a dissertation on "Stravinsky and the Ostinato". The following year he studied with Peter Maxwell Davies at the University of Adelaide before moving to Sydney and gaining his M.A. from the University of Sydney in 1967. He was awarded a French Government Scholarship in 1967 which enabled him to travel to Paris to study at the Conservatoire de Paris in the composition class of Olivier Messiaen, and then at the electronic studios of the French Radio between 1968 and 1970. During this period he also attended composition seminars held by Iannis Xenaxis and Henri Pousseur. Glynn has lived in Paris since 1967, working as a piano teacher, lecturer, and translator, but visits Australia regularly. In 1981 he returned in the capacity of Visiting Lecturer in the Composition School of the NSW Conservatorium. His music has been performed in Europe and America, as well as Australia, and in 1976 his Chanson de Ronsard for soprano, counter-tenor and percussion was one of the works chosen to represent Australia at the International Music Days held in Boston, Massachusetts, to coincide with the US Bicentennial celebrations. He has received numerous commissions from such ensembles and performers as the Seymour Group, Symeron, Hartley Newnham, Nicholas Routley and Sally Mays. Gerald Glynn also has an active interest in the music of non-western cultures, which has led him to travel extensively in Asia, Latin America and Africa. String quartet 2013 : Stillness (2013) This quartet was written at the request of Dieter Kauffmann, old friend and colleague, organiser of the concert at Alte Schmiede, Vienna. Lauros : duos for flute and clarinet (1992) Commissioned by Symeron. Filigrees III (solo piano) (1990) Commissioned by Sally Mays. Filigrees II (solo piano) (1987) Commissioned by Natalia Cohen. Love's coming : a song cycle for medium voice and piano on six poems by John Shaw Neilson (1986) Commissioned by Hartley Newnham, Nicholas Routley. 3 Mannheimer duos : clarinet duet (1983) Commissioned by Ursula Bickelmann, these duos were written for Beate Zelinsky and David Smeyers (Das Klarinettenduo).